Cream together egg, butter or margarine, sugar and milk. Dump flour over egg mixture. Sprinkle cinnamon and baking powder evenly over flour. With a fork, blend cinnamon and baking powder into flour and then continue blending until all ingredients are combined. Cover and refrigerate for at least two hours. Divide dough into four equal parts. Return three parts to the refrigerator and divide remaining dough into twelve equal parts. Sprinkle bread board with cinnamon sugar. Roll each piece of dough into a 10-inch strip while coating with cinnamon sugar. 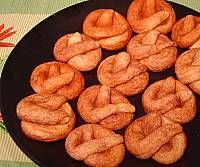 Twist into a pretzel shape and place on cooking sheet. Bake in oven until lightly golden.